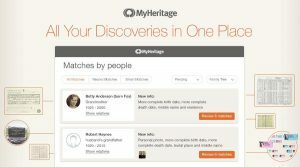 MyHeritage is excited to introduce their new and improved Discoveries pages that provide Smart Matches and Record Matches. The new pages are easier to use, more consistent, faster, and they work well on the website and on mobile devices. The Discoveries pages provide a unified experience for all matches, organizing them into two main pages: Matches by People and Matches by Source. Now, you can look at all the matches that were found for a particular individual in your family tree, or all matches found in a particular collection of historical records or matching family tree. Whatever you choose to use, the new pages combine Smart Matches (matches with trees) and Record Matches (matches with records) into the same unified and consistent interface. It is also possible to view only Smart Matches or only Record Matches (and not both together) if you choose to do so. Smart Matches and Record Matches can now be accessed directly from your family tree. Family Tree cards will display a green icon if Smart Matches have been found for an individual, and a brown icon for Record Matches. These green and brown icons will be displayed for every individual who has matches. New matches will be found in real-time, and you will be alerted to them with a flashing icon. 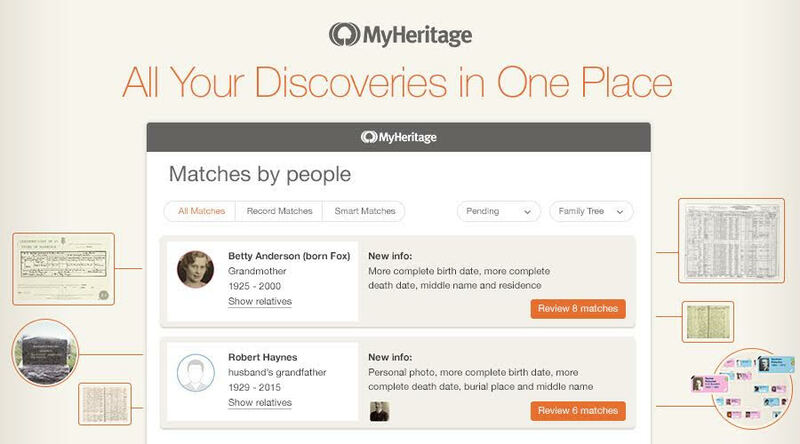 In addition, MyHeritage invented a unique and useful concept in matching that describes the incremental information that any match can add to your tree. They call this “Value Add”. The matches that are the most valuable will be listed first. This saves you time and lets you focus on the most valuable matches. You can save all new and improved information to your family tree. Previously, MyHeritage was sorting matches based on how confident they were that the match was correct. Those were put at the top of the list. MyHeritage has learned that, typically, those matches didn’t provide new information. If they were correct, then it meant that they were matching many fields and information that you already knew. The new sorting by Value Add ensures that the matches that can teach you the most – those that are the most exciting – are listed at the top of your matches. Every match now describes the Value Add as “new information”. Viewing Smart Matches is free. To confirm Smart Matches or contact the owner of a matching tree, a Premium or PremiumPlus subscription is required. Viewing the Record Matches is free, but viewing the details of a Record Match, confirming it or saving information from a Record Match to your tree, requires a Data subscription.